Further development of the self-propelled SU weapon demonstrated the necessity to adopt suitable mountings for supporting tanks in the attack. Technically, the SU-type offered (at the expense of traverse) the possibility of mounting more powerful weapons on a given chassis than in a turreted version. By late 1942 the requirements for tank chassis by the cavalry, infantry and reconnaissance units were being satisfactorily fulfilled and it became possible to undertake the production of self-propelled artillery mountings based on standard tank chassis. The Russians classified self-propelled guns into 3 categories according to weight: light (up to 20 tons), medium (up to 40 tons), and heavy (over 40 tons). It was not until 23 October 1942 that the Chief Defence Commissariat issued specifications for the design and construction of self-propelled mountings utilizing, as closely as possible, components of tanks already in production. Since the Army found the light tank to be ineffective in the combat conditions of that time, it was decided to turn the light tank facilities over to the production of self-propelled artillery. 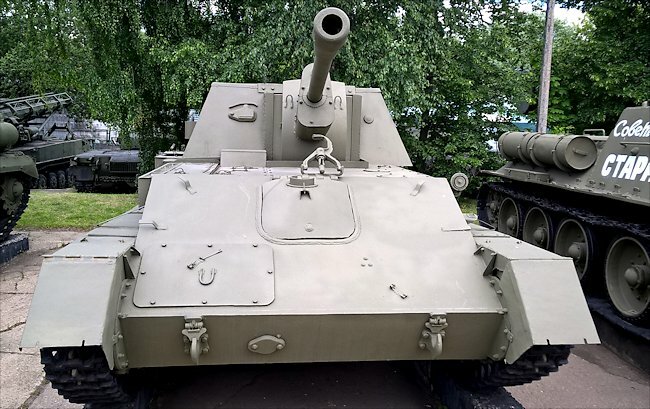 The contemporary light tank, the T-70, was therefore used as the basis for a 76.2 mm anti-tank mounting, the SU-76. The vehicle consisted of the 76.2 mm divisional gun M-1942/43 Model ZlS-3 L/42 mounted on a lengthened and modified T-70 light tank chassis. The driver, engine and fuel tanks were all moved to the front, so that the gun crew could stand on the floor of the hull rear and this arrangement kept the silhouette down to little more than that of the T-70 tank. The overall length was increased by an extra bogie being added to the running gear. 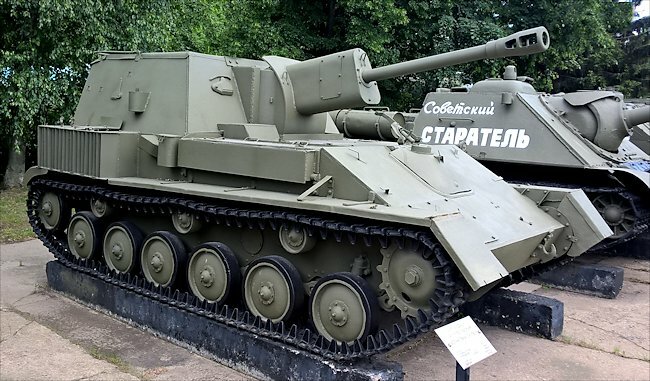 The slopped armour on the front of the SU-76 self propelled gun was designed help deflect enemy shells and make the armour harder to penetrate. The gun was served by a crew of 2, the gunner being to the left (in normal field artillery position). Here he was provided with a field artillery style on-carriage fire control, Schneider 1917 range-quadrant and mount graduated for various projectile types as well as in in metres, and a sight for the panoramic telescopic, the head of which protruded above the compartment armour. The section commander acted as the SU commander standing at the right, where he was provided with a standard tank-type episcope for observing targets and fire. being also provided with a vision port in the frontal armour. The gunner had his own episcope. Several modifications in the armoured superstructure have been observed, but generally it was rectangular in shape, open at the top and situated at the rear of the chassis. In an early versions the rear had two folding plates of armour, which provided both access and protection. On this version the radiator was located over the track on the right centre side (instead of to the right rear, as on later models), The sides and front sloped inwards, towards the roof. The rear of the superstructure and hull were of single-piece construction and incorporated a large door for access by the crew. The recoil mechanism for the 76 mm gun extended beyond the mantlet and was protected by an oval shaped armour cover. The hull was box-shaped, constructed of armour plate, with a sloping front plate. undercut rear plate. vertical sides and flat roof. A rectangular driver's hatch was located centrally in the front plate, just below the edge of the hull roof. Stowage boxes were mounted on the rear of the left track guard and along the right side of the hull and an air intake and an exhaust muffler were located on the right side towards the rear. The suspension, engine, transmission and other automotive components were as for the original T-70 light tank. The armour ranged from 25 mm on the hull to 10 mm on the floor. The newer vehicles were propelled by two 6-cylinder GAZ-203, in-line, air-cooled petrol engines, developing a combined output of 138 hp at 3,400 rpm. They were tandem-mounted in the right-hand side of the chassis. The SU-76 had a front drive sprocket. The 76 mm gun, which was provided with a double-baffle muzzle-brake, fired ammunition at the rate of 20 rounds a minute. It could fire a 13k 1b shell to a range of 10,250 vards. In order to properly engage contemporary German armour, the SU-76 had to use the high-velocity arrowhead shot, which meant engaging at relatively short ranges (550-440 yards). SU-76s were produced by the Uralmashzavod combine under the direction of Silnishchikov and Gorlick. Production began in December 1942. Some models had a 7.62 mm machine-gun mounted near the top of the superstructure, either at the right or left rear. The SU-76M used the GAZ—203 85 hp engine instead of the older GAZ-202 type. 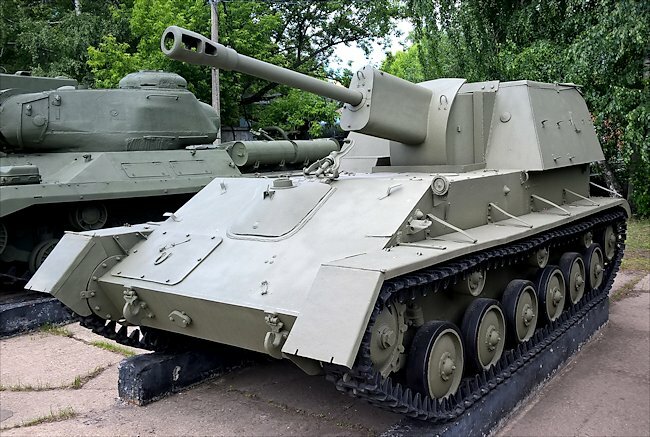 Originally developed for a tank destroyer role, the SU-76 was soon relegated to an infantry support role, largely through its lack of immunity to enemy fire, and also because of the rapid increase in German armour thickness. When phased out of service the SU-76 chassis were used as armoured recovery vehicles ARV's. Where can I find other preserved Russian SU-76M SPGs?